YO HO! 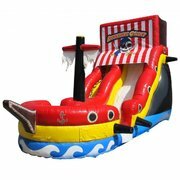 Our 20 ft Pirate water slide is bright and brings the spirit of Tampa Bay to your backyard event. This unit is a great rental for children and adults allike. This water slide features stairs to the left and the slide to the right as well as a large pool at the bottom of the slide. This water slide is red, with skull and crossbones as well as a cannon that rest a top of the slide and pirate flags towards the bottom of the water slide. It has a misting hose at the top to keep the Slide surface wet while you slide down to splash into the pool. The minimum set up area for this water slide is 40x20x24 and we need a 4' pathway to whell this water slide into your backyard. Be sure to add some tables and chairs for all your pirate friends.